Looking for the best cork underlayment for the panels? Cork underlayment for the panels is the premium product that ensures thermal insulation and acoustic isolation for every type of floating flooring. It is perfect for eliminating sounds during its usage that results in a greater comfort level. Efficiently eliminates any small faults in the surface under the installed flooring that increases its durability and longevity. The floors are quieter, warmer and more comfortable. Insulating cork underlayment is indefinetly durable and we can guarantee they will survive much longer than the floors themselves. Manufactured with the same technology as the cork in rolls, by mixing the cork aggregate with natural adhesive but, to enhance its insulation parameters, it has a lower density and less porous structure. In case of cork and rubber underlay used under flooring need that need a support of higher density, to the mix of cork aggregate a portion of rubber regranulate is added. Why cork is better than other underlays? Perfect thermal insulation and acoustic isolation. Cork underlayment for panels has an extremently low conductivity of heat and noise. It is always warm to touch, does not permeate nor absorbs our body heat. Contrary to other materials cork keeps its insulation properties in a wide range of temperatures. All this thanks to a special structure that is impossible to achieve with modern technology where for every cubic centimetre there are 40 million independent cells full of air. Each and every one of these perfect cells will incessantly, 24 hours a day, protect you and your family against cold, noise, vibrations and moisture. Vibration isolation. Thank to its particular porous structure and high elasticity cork does not transfer vibrations. What is why natural cork absorbs sound waves and vibrations perfectly. Dimensional stability. Thanks to the special properties of the natural cork, cork underlay is a great alternative for standard and not effective materials, such as poliurethane foam or corrugated cardboard. Cork is a dimensionally stable material which means that after laying the underlay, laying the floors and placing the furniture the cork layer of nominal thickness of 6mm will always be 6mm thick. In case of cheap foam and underlayment from thin wood fibres or porous fibre- boards the nominal thickness of the underlayment will be reduced by 50-70%. Are you really a fan of visible spaces between the floor and the baseboards? Elasticity and rugged surface. High pliability and irregular surface of the natural cork help eliminate and hide small imperfections of the surface. Cork cell membranes are very pliable thus, extremely elastic. That means it shall return to its previous state as soon as it is no longer under pressure. When cork underlayment is under high pressure gas inside the cells compresses and decreases their size. When the pressure stops, the cells return to their previous state and the cork doesn’t bear any signs of deformation. What imperfections could be covered by the foam that after a few days will have a thickness of a piece of paper? Impact on microclimate. Natural cork has properties that allow for the stabilization of temperature and humidity. It has a positive impact on the room’s microclimate and acoustic. It is an effective way to isolate the space from the negative influence of construction materials. Naturalness and ecology. In comparison with all the synthetic underlay i.e. polyfoam or XPS, cork is 100% natural and environmentally friendly during the production process, as well as during further usage. It doesn’t contain any harmful additives and useless fillers. Have you have asked the DYI market clerk about the ingredients of that foam? Antistatic and hypoallergenic. There are no electric charges gathering on the cork’s surface so it doesn’t pick up the static. Due to this fact it neither attracts nor absorbs dust. It doesn’t cause allergies and doesn’t pose a threat to the asthmatics. Is it still worth saving money by buying synthetic and cheap? Impermeability of gases and liquids. Due to natural suberin in cell walls, the cork is practically impermeable in case of gases and liquids. Water resistance will remain the same even after a number of years. When using foam would you dare to forget about a vapour retarder? Fire resistance. Cork is a naturally fire resistant material. When in contact with fire it burns without a flame and therefore doesn’t release any toxic gases. Is it the same in case of the foam? Neutrality. One of cork’s additional qualities is its chemical indifference. Cork underlayment does not react with liquids, doesn’t have taste nor smell and it doesn’t affect health. Thanks to the presence of tannins and lack of protein cork is not susceptible to humidity and rotting. Lightness. 90% of cork’s volume and 50% of its mass is air. Cork is a material 5 times lighter than water, and since it is impermeable, it is unsinkable too. This was one of he cork’s properties that were known and used for thousands of years. Damage resistance. Due to its honeycomb structure it is much more abrasion resistant than other underlays even with high coefficient of friction. Can an underlay of wood fibres withstand a hammer blow? Sustainable production process. Natural cork is made from the cortex of the cork tree, the ever-green type of cork oak that covers the wide areas of mediterranean coast. The layer of hard cork of a few to a dozen or so centimetres is separated from the trunk in the 10-year periods without any damage to the tree itself. 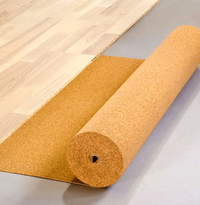 Cork underlayment is used under any type of surface, from floating floors (commonly known as panels), hardwood floors and wooden boards, carpeting, linoleum, PVC, to floor cork, natural stone and ceramic tiles. Natural cork is produced with care for low energy usages, practically nonexistent emission and minimum environmental impact. Choosing 100% natural cork products, you are contributing to the development of responsible, innovative and sustainable solutions, help protect our environment and future generations.